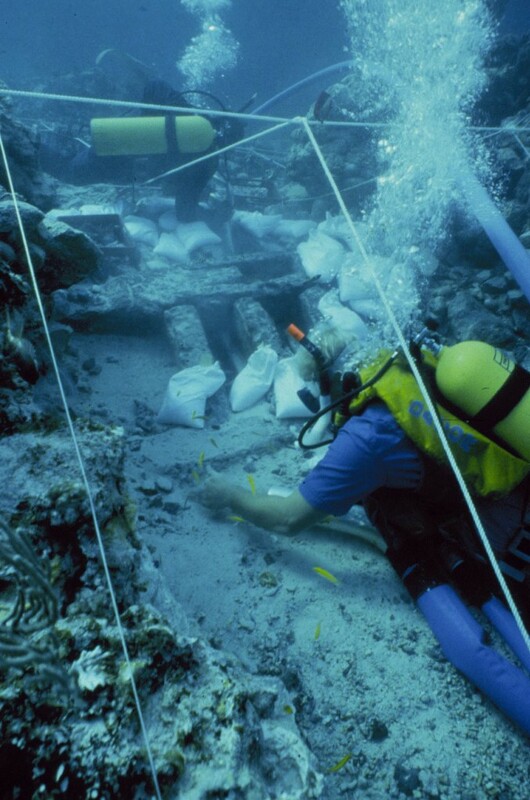 Discovered at Highborne Cay in the Bahamas in 1965 by sport divers, the shipwreck began to be salvaged with many of the artifacts winding up in the United States. Some of the armaments found their way to the Mariners Museum at Newport News, and a few were acquired by the Smithsonian Institution. Ordinance removed in the 1960s included bombardetas, versos, 18 breach chambers (one still loaded with black powder), shot, and an iron harpoon or spear. From 1967 until INA conducted a survey of the site in 1983, the wreck lay forgotten. INA personnel determined via a test excavation that the ballast mound preserved the bottom of the ship despite the ends of the vessel having been destroyed by the salvors in the 1960s. Specific areas of the wreck were targeted for excavation, these included the two ends of the wreck and a cross-section through its middle. Loose ballast stones were recorded and moved to reveal not only artifacts, but the remains of the ship itself. 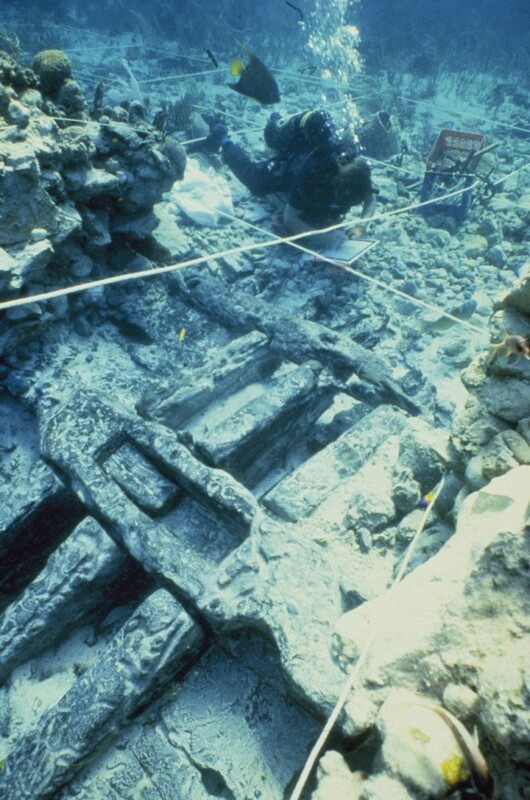 The team uncovered the remains of the ship’s keel, keelson, garboards, strakes, floor timbers, and ceiling planking. The post was also found, scarphed to the keel. The mast step had a large mortise for the mast’s heel. The step was reinforced laterally by three large timbers set to either side. These were, interestingly, not fastened to underlying frames but simply notched to fit over the stringers lying at their outboard ends. 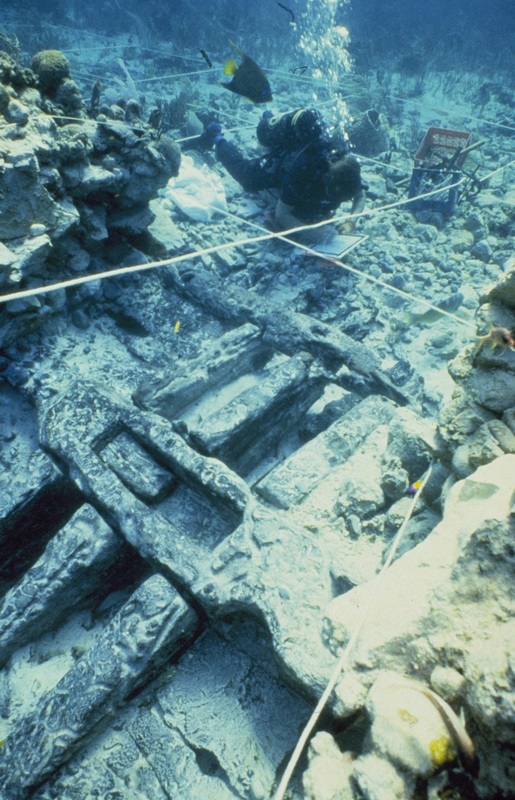 The positions and types of ordinance on the site pointed to similarities between this vessel and the one excavated by INA at Molasses Reef in the Turks and Caicos. Ceramics of various utilitarian types were excavated, all indicating an early 16th century manufacture. It is possible that the Highborne Cay wreck is one of the ships lost by Pinzon in 1500. D. H. Keith, “Shipwrecks of the Explorers,” in Ships and Shipwrecks of the Americas. George F. Bass, editor. (Thames and Hudson, 1988): 46-68. R. C. Smith, et al., “The Highborn Cay Wreck: Further Exploration of a 16th-Century Bahamian Shipwreck,” International Journal of Nautical Archaeology 14.1 (1985) 63-72. D. H. Keith, “Three Goals Set, Reached During Three Weeks at Hcay,” INA Quarterly 14.3/4 (1988) 6-7. T. J. Oertling, “The Highborn Cay Wreck: The 1986 Field Season,” International Journal of Nautical Archaeology 18.3 (1989) 244-53. ABOVE: Maststep uncovered, archaeologist mapping the site (Photo: INA HC-6). 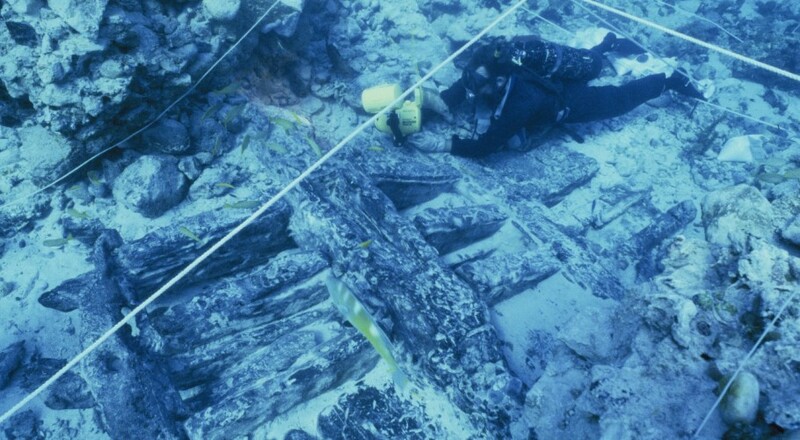 Archaeologists uncovering the ship’s timbers at the maststep (Photo: INA HC-4).